SMS marketing is one of the most powerful tools for marketers in 2018. And with statistics such as 98% open rates and 36% click-through rates, it’s easy to see why. But results aren’t just going to happen on their own. 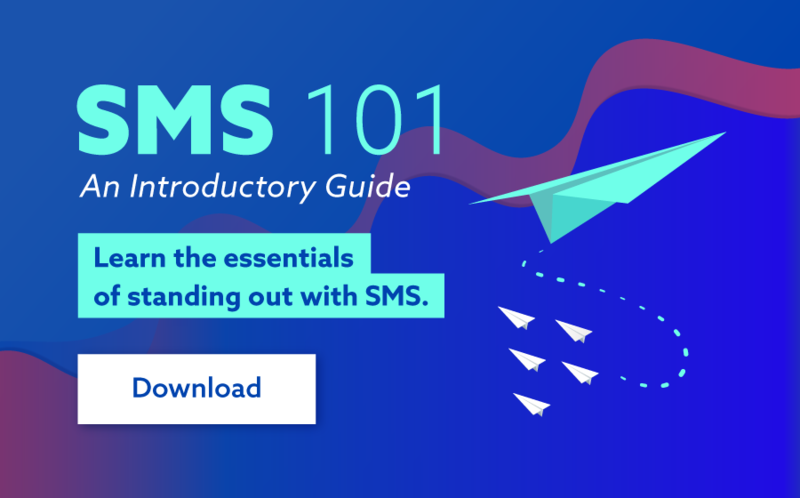 There’s a science and strategy around successful SMS marketing. Luckily, we’re here to give you our best secrets to kick-start your campaign. Here are 5 must-use tips for successful SMS marketing. The best time to send an SMS differs for each industry. However, research has shown that some periods of the day are more effective for general marketing messages than others. Sending between 10:30am and 11:30am, or between 2:30pm and 3:30pm, has delivered the best results. The morning message is a great way to get the jump on your competitors, but you should avoid messaging too early. A clever tactic is sending at an ‘unusual’ time eg. 10:43am. As opposed to sending right on the hour or half-hour, sending at uncommon times gives you less competition with other SMS marketing material. When a customer opts-in to receive SMS messages from your business, it’s important you tell them what kind of material you will be sending. If you’re going to be sending marketing messages about sales, discounts and new products, make this clear. This ensures your text messages are going to those that want to hear them. It will also give you a higher return on investment and develop a positive relationship with customers, rather than being seen as annoying or intrusive. 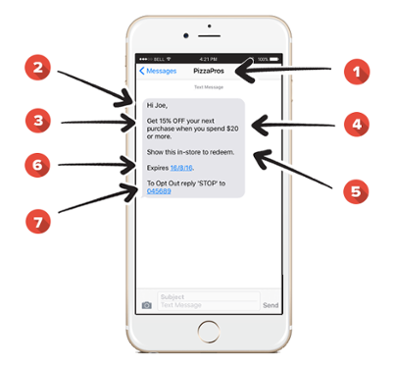 For best practice, remember to always offer an opt-out method for all SMS marketing messages. 1. Business name - Either as your sender ID or at the beginning of your message, you should make your company name clear to your customers. 2. Customer name - Create a more personal relationship by including your customer’s name at the beginning of your message. This process is made easy by using custom fields in web SMS software. 3. Offer - Here include details about your sale, coupon, new product etc. Use language that makes customers feel valued and excited by your deal. 4. Qualifier - This is similar to the ‘fine print’. Include any conditions for your offer in this section. 5. Instructions - Let the customer know how to redeem your offer. Try to keep this process as simple as possible. 6. Expiration - Consumers won’t find your offer ‘special’ if it never expires. Include an expiration date to create a sense of urgency. 7. Opt out - For best practice, and to avoid any legal penalties, you must include an opt-out option for your recipients. As we mentioned earlier, SMS messages have outstanding click-through rates. This makes SMS a great platform to boost your other channels. You can direct traffic to your website, landing page or social media page by simply including a link in your text. To help ensure your message remains under the 160 character limit, use a URL shortener to keep it concise. Many businesses struggle to achieve adequate open rates for emails. Sending SMS reminders to customers encouraging them to “check their email” can have a positive impact on email open rates. Sending your SMS marketing campaign out at your preferred time doesn’t require you to be at the office. Using a web SMS platform you can schedule all of your messages in advance. This is particularly useful when working across different time zones or for marketers with busy timetables. If you’re running a bulk SMS campaign, it may also be worth staggering your campaign. Send your messages out in smaller batches to make sure your system isn’t overloaded with requests. Scheduling and staggering are both part of our great online SMS software, MXT. SMS campaigns can achieve significant engagement and returns for your business. However, to maximise this potential it’s imperative that marketers follow certain codes and conventions of SMS marketing. With our intuitive SMS software, you can make running your SMS campaign a breeze. To get started with MXT today, go to www.smsglobal.com/web-sms-platform or contact our friendly 24/7 sales team on 1300 883 400.